Fencing and walls can add security as well as privacy to your home or business. Each one will provide a very different look and one of our team members will be happy to work with you on deciding which one is right based upon the look you wish to achieve as well as the benefits of each. 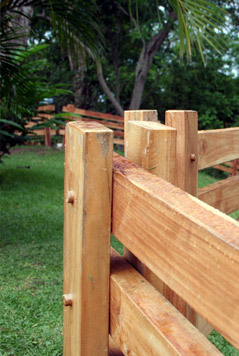 These wooden fences use pressure treated timber. We also offer wire fencing, which is an affordable solution when privacy is not what you are focused on. We use quality materials and focus on offering first class service to all of our customers. All of our walls are competently designed with a variety of styles that can be explored with you during the free consultation that we offer. You will find that we offer an array of colours and finishes. We pride ourselves on professional construction and are happy to provide you with a free quote and consultation with absolutely no obligation to buy. © 2014 CROCUS LANDSCAPES. All rights reserved.